Technology today is changing our everyday lives. Many people, however, aren’t aware that technology also is impacting dentistry in new and exciting ways. Cutting-edge innovations in dental instruments are requiring less time in the dental chair, causing less discomfort and creating satisfying results. One breakthrough instrument, called CEREC®, allows dentists to quickly restore damaged teeth with natural-colored ceramic fillings, saving patients time and inconvenience. CEREC is an acronym for Chairside Economical Restoration of Esthetic Ceramics, or CERamic REConstruction. Translated, it means that a dentist can economically restore damaged teeth in a single appointment using a high-quality ceramic material that matches the natural color of other teeth. How does the instrument work? CEREC uses CAD/CAM (Computer Aided Design/Computer Aided Manufacturing) technology, incorporating a camera, computer and milling machine in one instrument. The dentist uses a special camera to take an accurate picture of the damaged tooth. This optical impression is transferred and displayed on a color computer screen, where the dentist uses CAD technology to design the restoration. Then CAM takes over and automatically creates the restoration while the patient waits. Finally, the dentist bonds the new restoration to the surface of the old tooth. The whole process takes about one hour. What does this innovation mean for a patient? A tooth-colored restoration means no more silver fillings discoloring smiles. The filling is natural-looking, compatible with tissue in the mouth, anti-abrasive and plaque-resistant. Dentists no longer need to create temporaries or take impressions and send them to a lab. Because of this, the traditional second visit has been eliminated. CEREC has two decades of clinical research and documentation to support the technology. The restorations have been proven precise, safe and effective. How can I find out if this is an option for me? 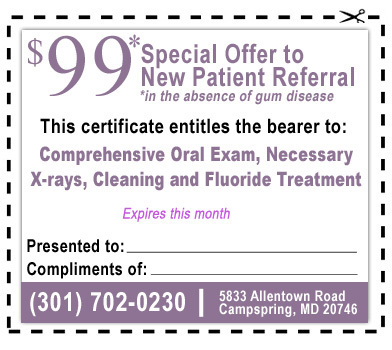 Contact Pampering Smiles at (301) 702-0230. We will be happy to answer your questions on this new technology.